Perhaps some of you who read my previous post about persimmon pudding would find it hard to understand how such a simple and humble dish could inspire such passion and yearning. Well, it’s impossible to explain, really. Clearly, it’s a hunger—but a hunger far deeper and more profound than a mere physical craving. After my Grandma passed away when I was a teenager and they were preparing to sell the farm (Grandpa had died years earlier), Aunt Ellen asked me if there was anything I’d like to have. Of course, there were a number of valuable antiques at the farm, but this is what I asked for: a picture of five kittens (representing the five senses) that hung in the bedroom where I always slept, two tiny celluloid swans that I’d played with as a child, and the last two pints of Grandma’s persimmon pulp left in the cellar. Soon afterwards, I made my very first persimmon pudding with that pulp. Years later, before Mama passed on (she had ALS), she gave me two treasured family heirlooms: Grandma’s pie safe and Grandma’s handwritten recipe for persimmon pudding. When we first moved here in February of 2008, I was thrilled to see that we had a persimmon tree in our yard. 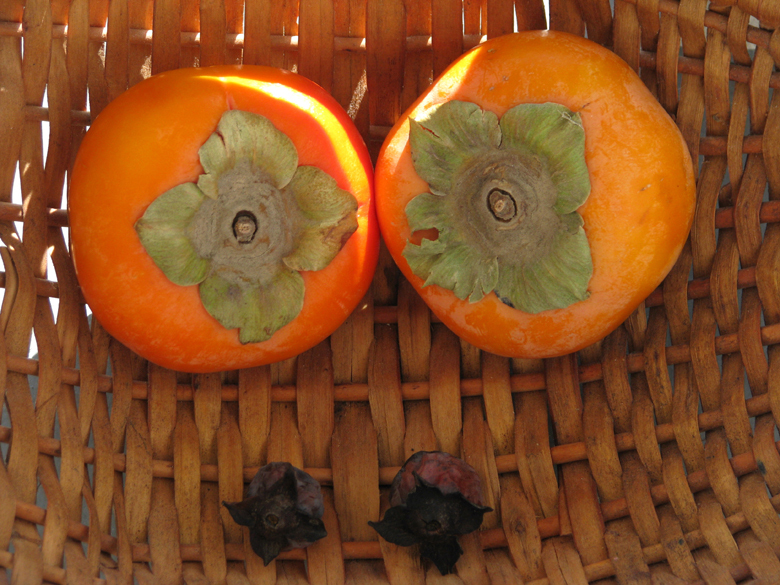 At that time of year, there were only a few black, shriveled, desiccated persimmons left hanging, but when I looked at them, I saw a bright future full of luscious, toothsome persimmon puddings. I could hardly wait for the next fall (fall having more than one meaning here, as mentioned in the previous post.) 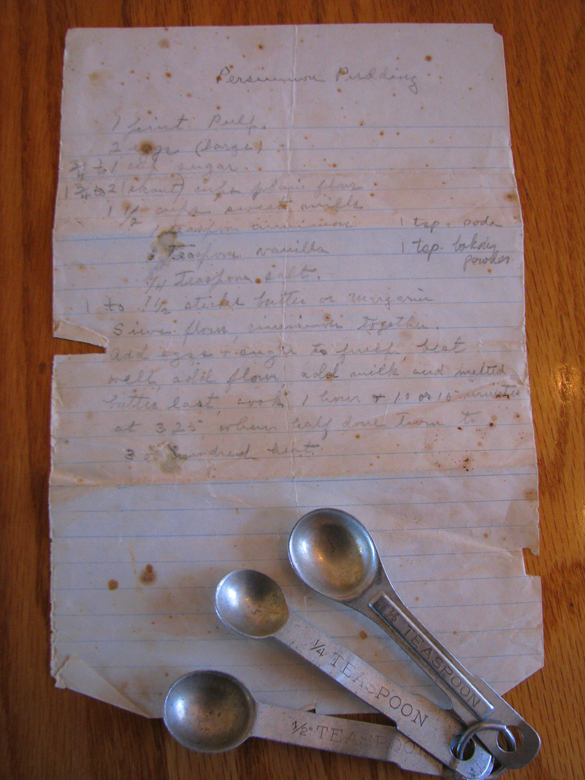 I pulled out Grandma’s handwritten recipe—yellowed now, the spidery handwriting splotched with evidence of long-ago persimmon pudding batches. 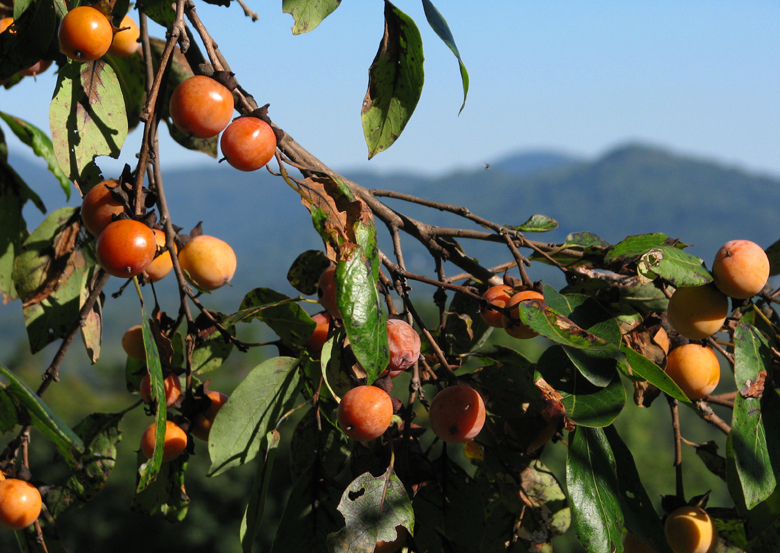 But the following October I was crushed to see that, apparently, American persimmons grow considerably smaller here in the Appalachians than they do in Piedmont North Carolina. Ours that year were the size of grapes, with a number of huge seeds to which the infinitesimal amount of pulp stubbornly clung. I was heartbroken when my efforts at squeezing out a modicum of pulp were unsuccessful. My pudding dreams were to be, alas, only dreams. But this year I was excited to see, after a previous spring of plenteous rain, that our persimmons were slightly larger—some even the size of small walnuts! I tried not to get my hopes up, but there were definitely visions of pudding dancing in my head (by the way, what IS a sugarplum anyway??). So, after the first cold snap, I could hardly wait to pick up the first ground ‘simmons. I took out the potato ricer that I bought just for the purpose of extracting persimmon pulp, put in a few persimmons, and squeezed. Oh, praise be to the Lord of persimmons, I got pulp! Sure, it took about 150 of the tiny persimmons and over one and a half hours to get the pint of pulp to make a batch, but I’m here to tell you—it was worth every tedious minute. I should give big credit here to Blue Ridge Blue Collar Man, who faced grave danger standing on a ladder on our steep hillside to pick the persimmons too high to reach. We had to—the critters here never left enough on the ground for us. I had to laugh as cars slowed, heads turning to look at us as we picked persimmons from another small tree we found near the road. I wondered if they were thinking, “Heh,heh…those folks are in for a BIG surprise when they bite into those persimmons they’re pickin’!” (Perhaps you recall my previous post, warning of the puckery perils of prematurely-picked persimmons.) Well, thanks be for the Internet, where I found that others had frozen the unripe persimmons they picked from the tree for at least 24 hours as a substitute for the night of frosty temperatures that persimmons need to ripen. That, along with a week of refrigeration seems to do the trick. For those of you that aren’t lucky enough to have a persimmon tree, there is an Asian variety of persimmon called Hachiya that’s a good alternative for the American variety. They’re expensive, though ($1.28 a piece at our local Ingles! ), not easy to find, and far more bland than the American (but don’t have the huge seeds, either, which simplifies things considerably). I found out, too, after I mistakenly bought a variety called Fuyu, that the Fuyus stay crisp, like apples, so don’t work for pudding. It’s impossible to explain what I felt as I took my first persimmon pudding in almost forty years out of the oven. It smelled exactly the way I remembered. After it had completely cooled (Grandma always refrigerated it before serving—it’s really not at its best warm), I cut it into slices with great ceremony and put two slices on my most beautiful Corelle. I was thrilled to be able to give Blue Ridge Blue Collar Man his very first persimmon pudding. As I savored the first forkful, my taste buds shouted Hallelujah and my eyes filled with tears. It tasted almost exactly like Grandma’s. Which is to say, it tasted like love, like kindness, like years of sweet memories. “It tastes almost like Grandma’s,” I said to Tom. Happy Holidays to all! May you find joy, peace, and comfort, whether it be in sweet memories of those who are no longer with us or the sweet company of those who linger. My Daddy was a restless soul—always looking, I think, for a place where he might at last feel at home or perhaps, at rest. So during my childhood, we moved seven times. Since he was a preacher, we always lived in parsonages, which were nice enough, but they weren’t really ours. It was sort of like having 200 or 300 landlords, since the congregation owned the house. But for the first part of my childhood, there was a place where I could have at least some sense of belonging, some sense of place—my maternal grandparents’ farm in Greensboro, North Carolina. Grandpa was a dirt farmer who raised vegetables that he sold at the curb market, along with eggs, milk, honey…and Grandma’s famous cakes and pies. She was known all over Greensboro for her coconut cakes (for which she grated her own coconut) and for her chess pies. I still remember watching Grandpa plow with a mule—he never had a tractor. I was scared to death of that mule. He’d fix his gimlet eyes on me and clack his teeth together, as though he’d like nothing more than to have a taste of my tender young flesh. But that old mule didn’t mess with Grandpa, who had leather skin and his own gimlet eyes. Even with all the critters taking their share of persimmons, there were always plenty left for us. Grandma had so much, in fact, that she’d end up canning lots of the pulp for later use. It’s possible, I suppose, that she used the persimmons for other things, but there was only one thing I was interested in and only one thing I remember—persimmon pudding. Persimmon pudding—food of the Gods. At least, that’s how I remember it. Almost every time we visited (I always thought of it as coming home), Grandma would make persimmon pudding (which isn’t really a pudding at all—more like a very moist cake.) 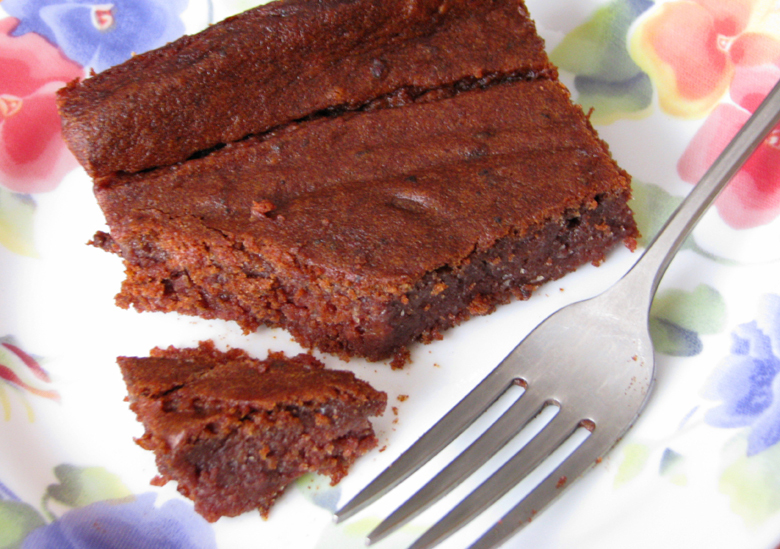 When I was small, I called it “brownies” because, in the pan (and sliced) the pudding looked like brownies. The best thing is, she made it especially for me because it was just about my favorite thing in the world, next to her boiled custard, that is. At least, I always figured she did. I still remember the pan she made it in. She used the same pan every time—an enameled blue spatterware pan, most often in her wood cook stove. Aunt Ellen bought her a nice electric stove later on (about the same time she had an indoor toilet installed) which sat, mostly unused, in Grandma’s kitchen across from the Piedmont wood cook stove. I reckon she felt a true bond and a certain intimacy with the Piedmont—she’d spent a good part of her life right next to it. When I envision Grandma in my mind, I picture her in front of that old wood cookstove, always with a feedsack apron on. 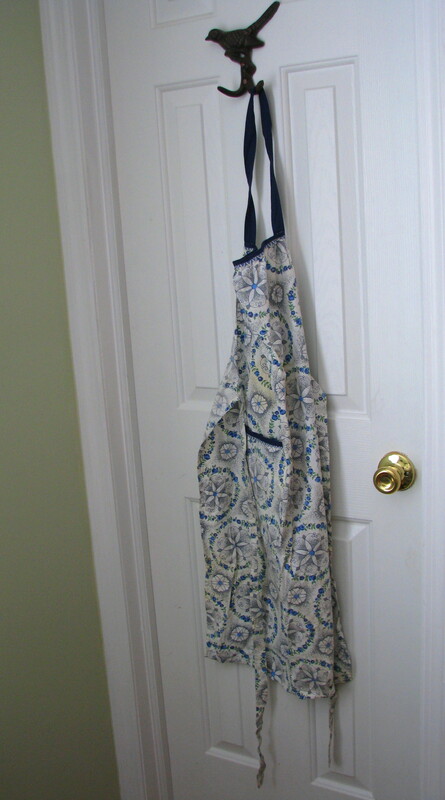 I still have one of her aprons that I wear from time to time. Somehow, it still has her essence clinging to it, as well as my Mama’s essence, since she wore it, too. That’s why I don’t wear it much—I’m afraid to get it dirty. Wouldn’t want to wash that essence out. It has some brown/yellow stains that might be burn spots—possibly from Grandma getting a bit too close to the Piedmont. Like a lot of folks, the holidays are a bittersweet time for us—fraught as they are with remembrances of those who have passed on and reminders of those who linger, of family we’re estranged from. It’s been a tough year for us, so I’ve been thinking more than usual about those who have passed on—those who we held dear, those who loved us unconditionally. I thought about Grandma and her persimmon pudding and how she’d smile conspiratorially and slip me another slice, even if I hadn’t eaten all my green beans, (like Mama told me I had to). And so I knew I had to have it this Christmas. This year, I really needed Grandma’s persimmon pudding, the memory of which has persisted all these years. 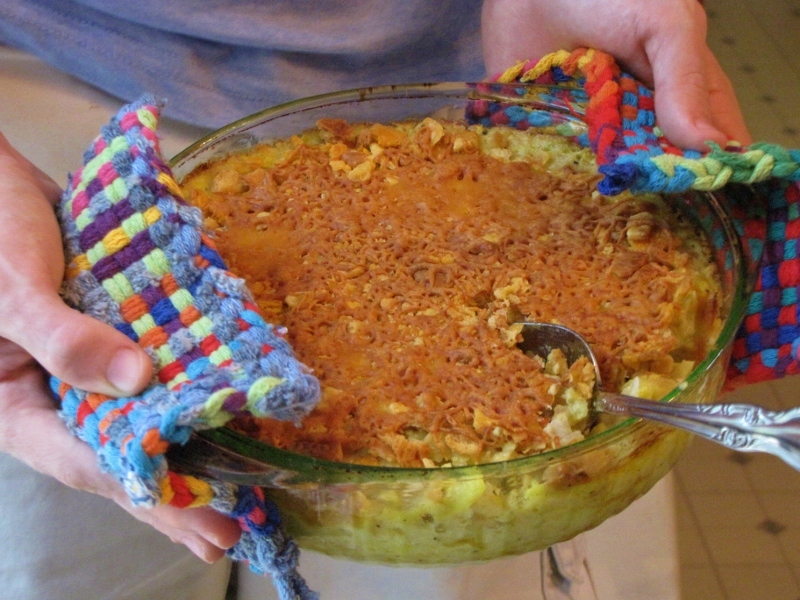 I knew I wanted to make it for Tom (AKA Blue Ridge Blue Collar Man), who’d never had the pleasure of eating it. And for Ariel and Benjamin, who’d only heard stories of the Food of the Gods—persimmon pudding. I knew I had to make them a pan full of love. I had the recipe—Grandma’s, the world’s finest. But where would I find persimmons? My friend Clara over at Clara’s Corner, in her comment on my last post, asked for the recipe to my Pear Bread. Well, the truth is, I’ve made that bread so often, I don’t use a written recipe, but I did write it down earlier for my children (in case I kicked the bucket or something) so here it is, for what it’s worth. I cook mostly by trial and error (which means my family often endures the trial of eating my errors), so I don’t use a lot of written recipes, although my family probably wishes I would. Okay, so I really should confess, too, that this is really as much cake as it is bread. In fact, I was looking the other day at my friend Judy’s wonderful recipe blog, Recipes From a Southern Country Cook and I noticed that an apple cake recipe she had on there was remarkably similar to my apple/pear bread recipe. But, you know, if I call it bread, we can eat it without guilt because apple/pear bread just sounds so wholesome and nutritious and…non-fattening. And if we called it cake, we’d feel awful for eating a whole loaf in one sitting. Not that we’ve done that, of course. Well…not a WHOLE lot. Well, not every day or anything…. Ahem…anyway, without further ado (or any more puns), here’s my recipe for pear bread. We like a spicy bread, so you may want to adjust the spice for your taste. Also, we like a very fruity, moist bread, so if you don’t, you may wish to add less fruit. Adding more fruit, however, makes it easier to rationalize that second piece! After all, fruit is GOOD for you! Mix together pears, white sugar, brown sugar, and pecans. Then, separately mix together the vegetable oil, eggs, and vanilla (I use a little electric hand mixer). Sift together flour, salt, baking soda, and spices. Then, alternate adding the pear, sugar, and pecan mixture and the sifted flour/spice/salt/soda to the oil/eggs/vanilla mixture. Or, really, you could just mix all of it together at one time, and I’m sure it would turn out fine. Mix well and put in two loaf pans. When I use a lot of fruit, sometimes I have enough for three loaf pans or at least, enough left over to fill a couple of those little tiny loaf pans you can get at Walmart. Bake at 350 degrees for 40-60 minutes (the tiny loaf pans obviously take less time) until top springs back when pressed. Let cool, then turn out of the pan. And, by now, the house smells so good that you just can’t help yourself. Go ahead. Have a slice or two. After all, life is short. Enjoy it!